The Nikon D7000’s Live View feature enables you to use the monitor instead of the viewfinder to compose photos. In many respects, taking a picture in Live View mode is no different from regular, through-the-viewfinder photography. But a few critical steps, including focusing, work very differently when you switch on Live View. Switching to Live View: Rotate the little lever on the Live View switch to the right and release it. As soon as you take this step, you hear a sort of clicking sound as the internal mirror that normally sends the image from the lens to the viewfinder flips up, permitting the Live View preview to start. Then the scene in front of the lens appears on the monitor, and you no longer can see anything in the viewfinder. The Information screen, too, is no longer available; instead, critical settings appear superimposed over the live scene on the monitor. Shooting photos: Things work pretty much the same as for viewfinder photography — frame, focus, and press the shutter button. The main difference relates to autofocusing. Recording movies: Press the red movie-record button to start and stop recording. Your focusing options are the same as for still photography in Live View mode. Choosing camera settings and viewing photos: Press the Menu button to access menu settings or press the Playback button to view pictures or movies, as you normally do. You also can adjust settings via the usual external buttons, with the exception of the Qual button: In Live View mode, the button magnifies the display, so it can’t be used to access the Image Size and Image Quality settings. Instead, set both options via the Shooting menu. 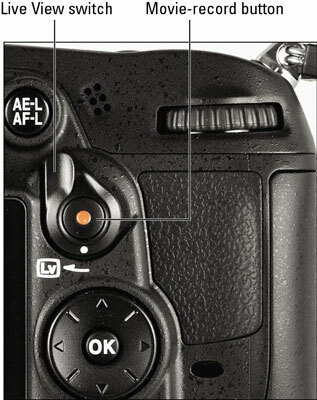 In Live View, you can control the same settings as for regular viewfinder photography. Exiting Live View mode: Rotate the Live View switch a second time.